Chemistry and physics of the element silver and its chemical compounds. Silver - chemical symbol Ag (latin: argentum), atomic number 47 - is a soft, white, lustrous, very ductile and malleable chemical element with the highest electrical and thermal conductivity. Silver belongs to the group of transition metals (copper group). Online available information resources about the chemistry and physics of silver and the silver compounds. Ions, not particles, make silver toxic to bacteria. 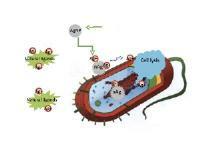 Rice University researchers report too small a dose may enhance microbes' immunity.